Glad you found it useful. I am checking on the part number now. The first part of my upgrade I replaced the 6.5" with the 8" and 3.5" speakers in the rear doors. FYI, running off the base amp it sounds no better at all. Waiting for my new amp to arrive and will have to wire up all additional speakers as my car is not pre-wired. I would love to add just the sub and 825 amp to my 2015 RR Sport base stereo system. Anyone familiar with which amp I need to upgrade to? There are way too many product numbers. I attached a pic of my current amp. Thank you ahead of time. Is there a reason why you wouldn't use the amp I used? 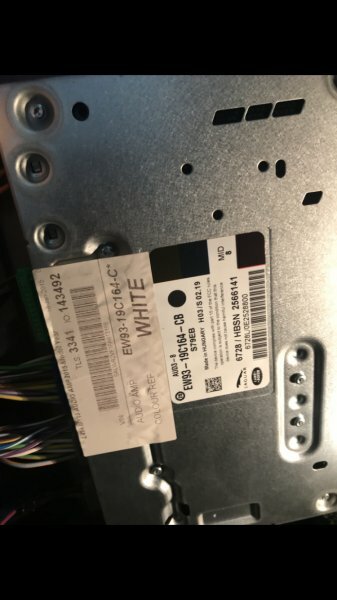 "For the amp, I bought a used one one on eBay - BJ32-19C164-BF"
Something to consider: You are going to have issues with your bluetooth audio, etc., if you do not install the mids in the front doors. If you don't use bluetooth than go for it. If you do use it, you will not be happy with the outcome, IMHO. Thanks Hiyabrad, I will definitely add the mids in the front door, thanks for all your hard work on this thread BTW. As far as the amp goes, I am trying to get a better understanding what the differences are between the many model numbers and buy one that is somewhat compatible with my model package.